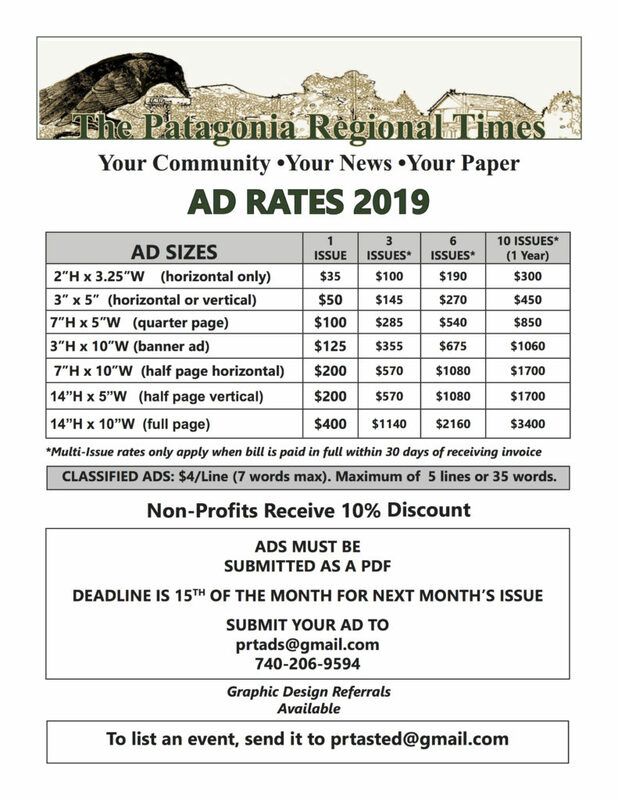 The Patagonia Regional Times wants you to advertise with us, THE source for local news for the communities of eastern Santa Cruz County. We will work with you on maximizing your investment with design tips, referrals to affordable local designers and discounted rates for multi-issue advertising. We are reaching the right readers in the right places for our advertisers. Your ad will be viewed by our base of more than 4000 readers, both locals and tourists, in the Mountain Empire Area. People are looking for shops, restaurants, activities, places to stay and services. Help our readers learn about your unique business or service! We have the advantage of being able to deliver the local content that other news media often lack. As newspapers around the world struggle to stay afloat. As a matter of fact, readership and advertising are on the rise for the free community newspaper industry, according to the Association of Free Community Papers. Advertising with the PRT is your opportunity to showcase your business, but it is also a way to contribute to this valuable community resource. The continued success of this free, non-profit newspaper is the result of the hard work of many people: an amazing, supportive board of directors; the dedicated staff, our volunteer editorial team and, of course, our generous donors and advertisers, the real heroes who enable us to continue to produce this wonderful community paper. The mission of the PRT can be summed up in two words: Partnership and Trust. The staff, board and volunteers collaborate to put out the paper each month but our community, and our readers are equally important partners in this venture. Our primary responsibility is to serve the interests of our readers by providing news that they can trust is accurate and unbiased and providing a forum for the civil ex- change of ideas. Advertising with us helps you, helps us, and most importantly helps our community thrive. -Creative Spirits Gallery, Local Business in Patagonia, AZ. We also have a section for Classified Ads in our paper. -Ron Walp in Oregon, a winter guest.